The Last Nail and Hand Product You'll Ever Need. "...a quick fix for brittle nails; NailPrime® really strengthens and hardens." "Nature's solution to brittle nails." 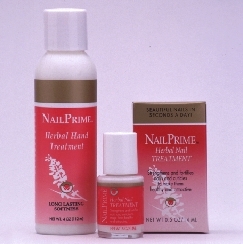 Use NailPrime® Herbal Nail Treatment for a quick, long-term fix. For optimum results, add the NailPrime® Supplement and Herbal Hand Treatment as part of your daily health and beauty regimen. Remember, beautiful hands begin with stronger healthier nails. Discover why Glamour Magazine and thousands of men and women are raving about NailPrime® Herbal Nail Treatment, and why it is the last nail product you'll ever need. It's unconditionally guaranteed. If you're not completely satisfied with any of our NailPrime® products, simply return the unused portion to us within 30 days of purchase, and we will refund your money.